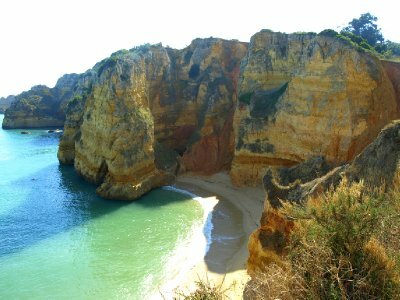 Lagos is situated in the western Algarve and has all the ingredients for a wonderful holiday experience - great weather, plenty of attractions, a friendly atmosphere, a wide selection of restaurants and bars, excellent beaches and fantastic golf courses. 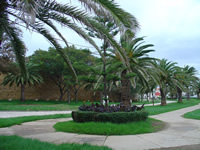 Its easy-going atmosphere attracts visitors of all ages, all-year round. 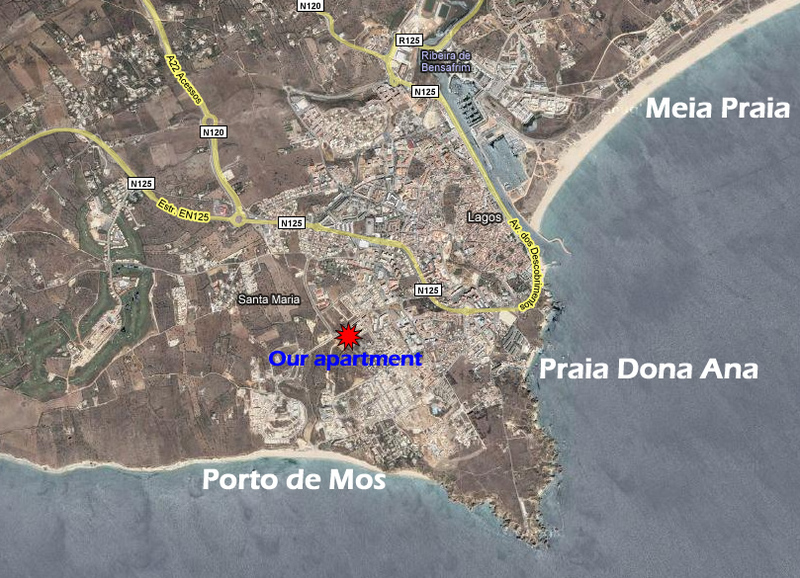 The town is approximately 50 minutes drive from Faro airport, and our apartment is just five minutes from the A22 motorway. 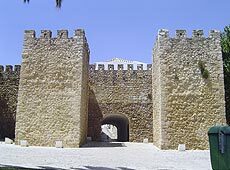 History: This ancient port city is today one of the most popular holiday destinations on the Algarve, sited as it is within walking distance of some excellent beaches. Visitors to Lagos can also take time to discover some of the town's history, which goes back to the Carthaginians several centuries BC. During the great Portuguese age of discovery under Henry the Navigator, the port became a caravel shipyard and was the jumping-off point for many a voyage to the East. Also to be seen is Customs House - within its arches Europe's first slave market was conducted in 1441. There is also the beautiful church of Igreja de Santo Antonio, restored in 1715 and decorated with fantasy-inspired carvings. The municipal museum in the town houses an interesting and varied collection from Roman artifacts to deformed animal foetuses. The most splendid beach is Meia Praia to the east of town; the southern promontory features some sheltered cove beaches; while Praia de Dona Ana is picturesque and quoted to be the most photographed beach in the Algarve. The Lagos area has many beautiful beaches. The map shows the location of the most popular choices. Shopping: Besides an ongoing flea market that sprawls through the streets, Lagos boasts numerous fascinating shops and boutiques, especially in the pedestrianised old city. Browsing is as pleasurable as buying in the well-stocked shops that are bristling with attractive local wares, from wickerwork to filigree jewellery, copperware and leather goods to wine and pastries. 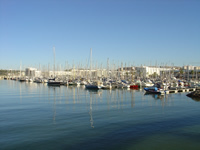 There are numerous shopping centres and retail parks along the EN125 between Lagos and Faro. The nearest supermarket is Intermarche, located just 1 km from the apartment. Restaurants: Eating out is part of the pleasure of a holiday on the Algarve, and Lagos offers the best of the best choices of establishments in which to indulge. Seafood lovers will be ecstatic, but no-one, even vegetarians, will be disappointed or go hungry. 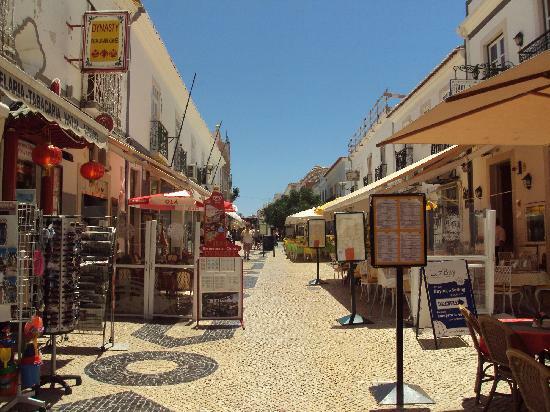 There are litterally hundreds of eateries in Lagos, ranging from the larger establishments on Rua 25 de Abril, the main pedestrianised street in town, to small traditional Portuguese restaurants dotted around town. Some of our favourites include the Triangulo, approximately a 10 minute walk from the apartment, whilst in town you should try A Forja (The Blue Door), O Artista, O Galeao, Don Toro Steakhouse and many more! Details on these and more restaurants will be sent to you upon confirmation of your booking and are available in our extensive information book in the apartment. Nightlife: The centre of Lagos comes alive in the evenings with buskers and street entertainers. 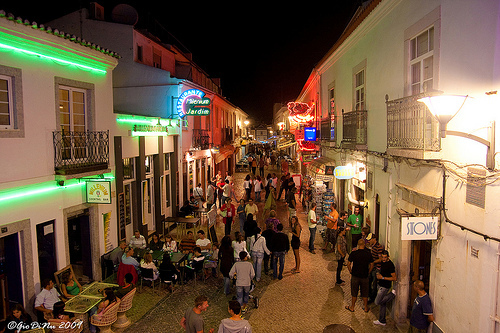 The nightlife in Lagos can compete with any holiday resort in the Algarve, with several energetic dance clubs and character-filled bars strewn through the main part of town. Of the bars, the most popular are Bar Amuras at the marina, the Red Eye Bar on the Rue Candido dos Reis, and Zanzibar on the Rua 25 de Abril. Most have music, darts, pool tables and Sky TV sports channels. Activities: There is little need to do anything more to enjoy your holiday other than sprawl on the sandy beach with an occasional dip in the ocean, but those who need more activity can choose between dozens of pursuits like sailing, wind-surfing, fishing, para-sailing, microlight flights and scuba diving. Golf is a major attraction here, as it is throughout the Algarve, with the Palmares, Boavista and Alto courses nearby, offering a round with sea views. There is also the challenge of the Penina Championship Course, site of many a Portuguese Open. See our dedicated golf page for more details. Those who hire a car will be well-rewarded in exploring the adjacent coastline and seeking out unspoilt villages and beaches.